Mood disorders, such as depression and manic depression, affect up to 10% of the population. Marja Bergen is one of those people. Over the 30 years that she has had manic depression, she has gradually adopted a lifestyle that makes it possible not only to cope, but to live a full and productive life. In Riding the Roller Coaster, she shares very practical tips on such things as escaping the blues before they grab you, what to do when you don't feel like doing anything, and keeping life stable. This excellent first person account is filled with encouragement for those managing mood disorders. It delivers understanding, insight and very tangible strategies on how to overcome the difficulties of depression and manic depression. Marja Bergen gives us a very human perspective drawn from her experiences. Her path to recovery is exciting and positive. Despite increased understanding by the scientific community, there is still a big gap in the understanding of these illnesses by the general public. Long-time Burnaby resident, Marja Bergen, has tried to help bridge this gap. 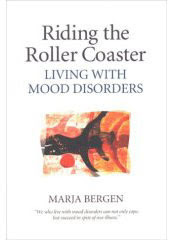 Having suffered with manic depression (or bipolar disorder) for the past 34 years, Bergen knows what it is to experience the elation of mania and the despair of depression in the book, she draws from her experience using personal vignettes from her life as well as offering strategies for dealing with the problems that arise. Bergen offers encouragement to the reader with essays such as: Dealing with the Stigma, Keeping a Balance, If You Can Trust Yourself...and Building Confidence. The publication of her book is very timely as there are indications that mood disorders are a growing problem in the workplace. Personal vignettes and real-life examples abound in Bergen's book, including frank descriptions of her own history, from her first treatments in Riverview, to problems adjusting medications in later years. The book is easy to read, and while Bergen's style is warm and encouraging, it is also clearly written from her own experience. The book is not only helpful to sufferers of mood disorder related illnesses, but also to their families to understand what it is that their family member is undergoing. This book come highly recommended as integrated resources for pastoral counselors as well as other caregivers in parishes who are committed to working with the spiritual aspects of depression within the larger framework of holistic health. Bite-sized essays. Brimming with wisdom, forgiveness, acceptance and practical advice. One can easily pick it up and read just a page. I especially appreciated the “we” tense used throughout and her just plain good sense of things that often get overlooked in our battle with the pathology. Marja Bergen has crafted an invaluable tool from her life experience with a challenging condition. A great deal of anguish for sufferers and their families, as well as time and money for the mental health system, would be saved if this book were standard issue for all people diagnosed with manic-depression. The book is relatively small and easy to read. It is excellent material, and presented simply and clearly. From her reading, research, and most importantly, her experience of living, Bergen has put together short writings on different aspects of depression and manic, and in a very readable format. This book needs to be read by sufferers of depression and mania, as well as by their family and friends as well. I also wish that psychiatrists who treat people who suffer from depression or manic would hand out a copy of this book along with their prescriptions. If they did, they would be surprised to find out how more effective the medications would become.